Acana Singles Grass-fed Lamb Dog is dog food with sun-cured fruits and vegetables and lamb as only source of protein. Acana Singles is formulated with one single source of protein supplemented with a small amount of vegetables, fruits and herbs. The Singles mostly consists of nutrients that occur naturally in the ingredients; synthetic ingredients are reduced to a minimum. 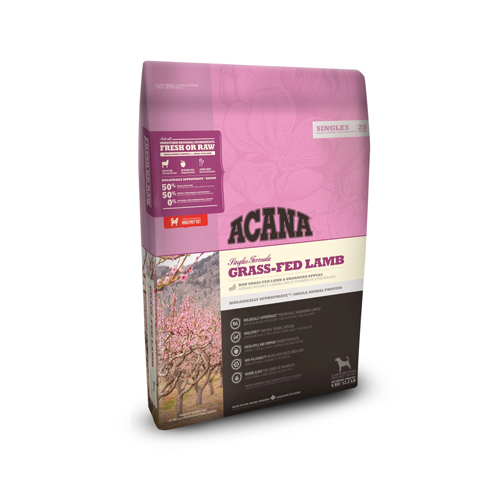 Acana Singles Grass-fed Lamb Dog contains lamb and sun-cured fruit and vegetables from the Canadian Okanagan Valley, supporting a healthy digestion. This combination of ingredients makes Acana Singles Grass-fed Lamb Dog suitable as an elimination diet. Acana produces natural pet food with local ingredients, taking into account the evolution of dogs. Their original diets were protein-rich and full of fresh meats. The ingredients are bought locally (Alberta, Canada). Acana Biologically Appropriate is formulated with fresh meat, fresh fish, vegetables, fruits and herbs suited to the needs of your dogs. Have you used Acana Singles Grass-fed Lamb Dog before? Let us know what you think about this product.